I'm about to tell you a story about this ornament even my husband doesn't know. I remember when we bought it. 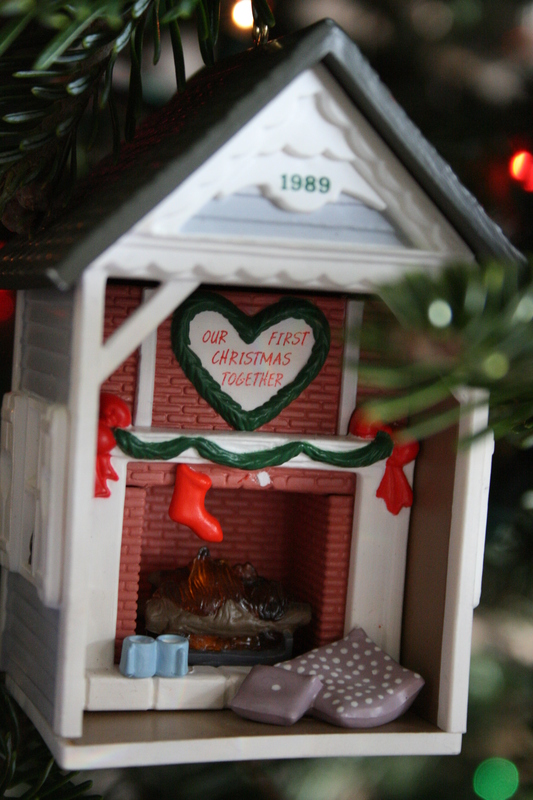 I was insistent that, dammit, we were going to buy a "First Christmas Together" ornament if it killed us. And, jammed shoulder to shoulder in Woodfield mall, it very nearly did. My husband was extraordinarly frustrated with me. If I hadn't put my foot down we'd have left without the dratted thing. But, to me, failure was not an option. Working our way through the crowds, we found a store that sold Hallmark ornaments. I picked out this one. You take a bulb off a string of lights and plug the ornament in and it has a "fire" effect. All comfy, all cozy, so very first two months of marriage. After we'd been married, oh, six or seven years or so, I got so angry with my husband I threw the ornament in the garbage. Later, thankfully before garbage collection day, I dug it out and found one of the little stockings missing. I kept telling my husband it couldn't be a good sign we lost one of the stockings. What I neglected to say was that it was actually my fault. A little. So much for that secret. For the record, I don't remember what he did that made me so angry. But I'm sure he deserved my throwing the ornament in the trash. I'm very level-headed, you know. I don't do such things lightly.